Saving water is the most important thing to consider when doing a bathroom makeover, as the toilet alone can use as much as 27 percent of household water. Although much of the waste is caused by bad habits, installing and maintaining water-saving bathroom fixtures is an enormously important step. Here's how: Start by installing low-flow showerheads and faucets; next, fix any leaks as soon as they happen (including continuously leaky toilets, which can waste as much as 300 gallons of water every day). A further step is to set up a gray-water system that collects water from the sink and shower and feeds the toilet and the garden. You can also read our How to Go Green: Water guide for more helpful ideas. Given the amount of time each of us spends in the bathroom, we think we should all be able to enjoy it. So why do American bathrooms resemble closets? In a traditional Japanese bath, for example, the view framed by the window is an important part of the design of the bathroom. Make sure your bathroom includes windows, for natural light, the view, and ventilation. Forget the American dream of a bathroom for every bedroom (and then a powder room for the guests!). Put the toilet in a separate space to isolate bacteria -- it takes up just a little more space, and is almost as good as having a second bathroom as one person can be using the toilet while another is using the sink or tub. Almost everything about our toilets is wrong: Drinking water is used for flushing waste, which becomes "black water," which contaminates the "grey water" waste that comes from everything else in the bathroom (and could otherwise be reused). Black water is hard to clean and flushes away valuable resources (see the Getting Techie section for further discussion of gray- and black-water). For example, urine is a valuable source of phosphorus, and poo could be composted into fertilizer if it weren't hauled off to the nearest water treatment center. Plus, toilets aren't designed around the way our bodies work: Sitting, rather than squatting, has been linked to hemorrhoids, constipation, and colon cancer. Replace the lid of the tank with a washing lid -- a sink on top of the tank -- where the water for the flush first goes through a faucet where you can wash your hands. Use a no-flush urinal, for the men (and agile women) in your house. Install a low-volume toilet or dual-flush mechanism -- that's one for, er... a number one, and two for a number two. Get the lowest toilet you can find, with an elongated bowl then adapt it for squatting. For sitting toilets, buy a toilet seat that can be removed for cleaning. Beyond the big step of purchasing a hybrid sink-toilet, such as the one mentioned above, where the grey water from the sink is used in the toilet bowl, there are many other options to consider when choosing the right sink. First, the sink vanity height should be at least 36 inches, which will allow you to stand up straight while you wash, which is easier on the back. Next, consider a kitchen-type faucet with sprayer, so that you can rinse the sink easily -- you can save water and wash your hair with it, too. Finally, consider the materials and layout of your sink: Hospital-plumbing brass sinks, which have big paddle handles that you can operate with your elbows (so you don't have to touch 'em with your dirty hands), and go with recycled and eco-materials, such as natural ceramic or non-toxic cement, for your hardware and sink basin. Standing barefoot on a curved, smooth surface, while adding water and soap might not be the safest way to start your day, but that's what many of us do in the shower each day. Instead, we recommend building a shower stall, separate from the tub, or just forget about the tub altogether, as taking a bath can use seven times the amount of energy as taking a short shower. Install a handheld showerhead so that you can aim it up as well as down, and put in grab bars; no matter what your age, people slip in showers a lot. Consider a molded fiberglass shower instead of a tiled one, as they are easier to keep clean. Avoid vinyl shower curtains -- either PVC-free plastic or even hemp is a good alternative -- and if you get glass doors, use a squeegee to clean them after you shower, which will help you avoid using chemicals to remove the scum that forms otherwise. Set up a solar powered water heater -- they used to be either expensive or just not very effective; now many companies are selling evacuated tube water heaters for under $5,000. Install a waste-heat recovery system (pdf) that preheats the shower water with the warm water going down the drain. Bathrooms are warm and damp, a perfect environment for mildew and mold. You can attack this problem with chemicals and bleaches, or you can simply keep the humidity levels down below their comfort zone. Every house or renovation should include the installation of a Heat Recovery Ventilator, or HRV; if you build to any kind of standard, you need fresh air intake. When you bring in fresh air you need to balance it with exhausted air, so take it from the bathrooms. This will ensure that there is a constant flow of air and continuous removal of excess humidity. Increase the air flow in your bathroom further by using a low power consumption fan (preferably remote installation, where it is mounted at the exhaust point rather than the intake point). Include a timer switch so it will turn off after the bathroom moisture has subsided. We line cover our bathroom floors with big, shiny, pore-less tiles, often radioactive granite; just the thing to slip on. Use non-slip tiles including a tiled baseboard, and put in a floor drain - let it take away excess water when you get out of the shower, instead of a using a soggy bath mat that keeps releasing moisture. Use materials that don't promote mould and mildew growth, are eco-friendly, and are easy to clean. In Japan, a lot of baths are lined with cedar and wood; cork and water resistant woods have natural mold inhibitors in them. For floors and walls go with recycled glass or ceramic tiles, Marmoleum (a good old fashed linoleum material), low-VOC paints, and natural plasters like American Clay, which absorb and release moisture, mitigating the potential for mildew. For countertops, consider those made from recycled glass cullet, or compressed, sealed, recycled paper, such as Paperstone and Richlite. 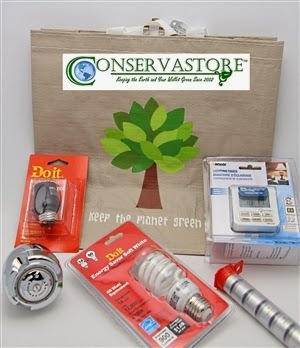 Visit us at Conservastore.com for all your green needs and solutions!! We like to introduce you to our new Sav-Eco Kits an easy way to start saving water, energy and money! For green house cleaners I prefer using green safety towels or soft microfiber cloths. And natural glass & surface cleaner with its ready to use trigger sprayer for glass and other smooth surfaces. I need to get a new shower installed in my bathroom. Right now I have a narrow standing shower. It would be so much nicer to have a bathtub option as well. These are great information on how to go green with your bathroom. Every home owner should take some time to read this so that they will have the idea on how to improve their bathroom in a greener way.